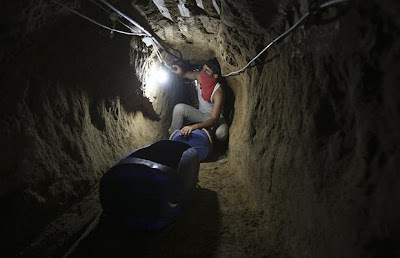 Hundreds of Gaza merchants throng around the border area of Rafah every day to pick up merchandise coming to Gaza from Egypt via subterranean passages. Gaza's markets are seriously lacking in merchandise due to strict Israeli restrictions on what the country may and may not import. Goods are dropped into and received from the underground network via elaborate pulley systems. They are then carried down the length of the 1,000 metre tunnels. The network operators have the ability to handle all sorts of products including fuel, computers and clothes. Underground livestock smuggling has increased dramatically ahead of Eid Al-Adha, a day when Muslims the world over slaughter animals and feed the poor to seek God's forgiveness. 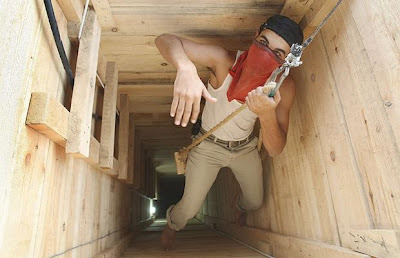 The tunnels also ferry people who cannot leave or enter Gaza, but no one may smuggle arms or drugs through the tunnels. After travelling through the underground tunnel, the frightened cattle is sold, making a heavy profit for those who risk their lives in the dangerous tunnels. 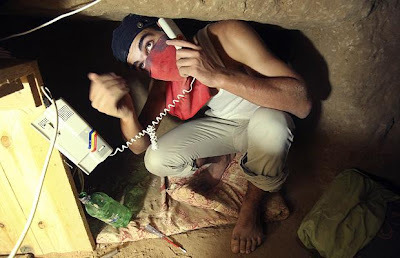 Palestinian officials say at least 45 workers have died this year because of cave-ins. 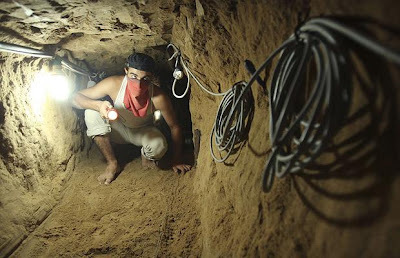 Hamas, which seized control of Gaza in 2007, see the tunnels as an act of defiance against Israel. They, therefore, endorse them and it is even claimed that taxes are imposed upon the underground routes. Crazy Art Of McCain And Obama Onto Bread ! World's Most Strange Species - Geoducks ! A Dinosaur Dance Floor !